This is one that I’d been planning for some considerable time. 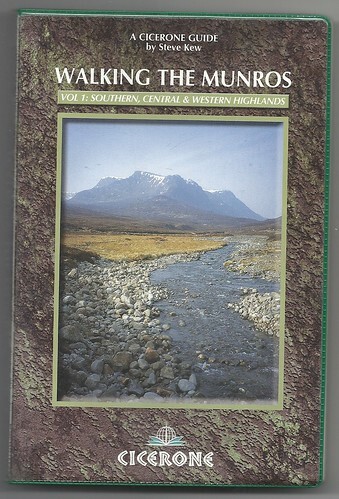 Ever since the CEO gave me Steve Kew’s “Walking the Munros” for my 2009 birthday - (I wonder if she regrets doing that now…???) 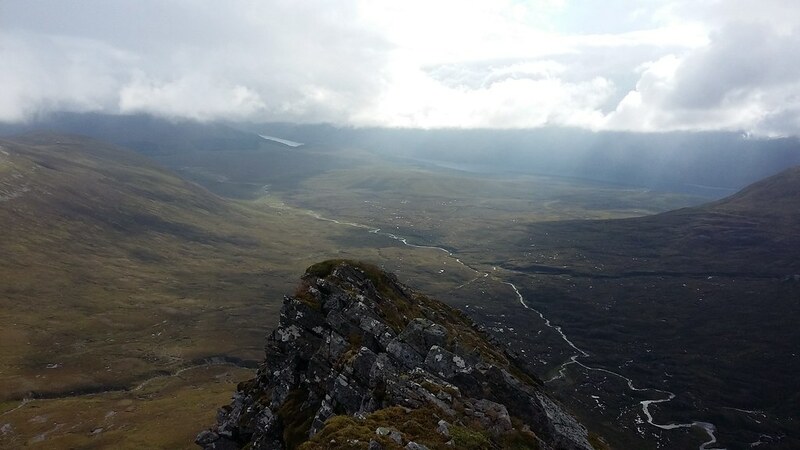 - I’ve wanted to walk Ben Alder – on the front cover there’s a fabulous picture of this magnificent mountain at its most seductive…. .
And who with even the mildest liking for mountains could fail to be seduced? I looked at a good number of possibilities for a round, trying to trade off the practically possible with the unlikely but dreamable; and finally came up with the route below, starting at Loch Pattack rather than Culra because I didn’t fancy an extra 4 km or so walk back from Loch Pattack to Culra at the end of what would be anyway a long day. 9 + 5? 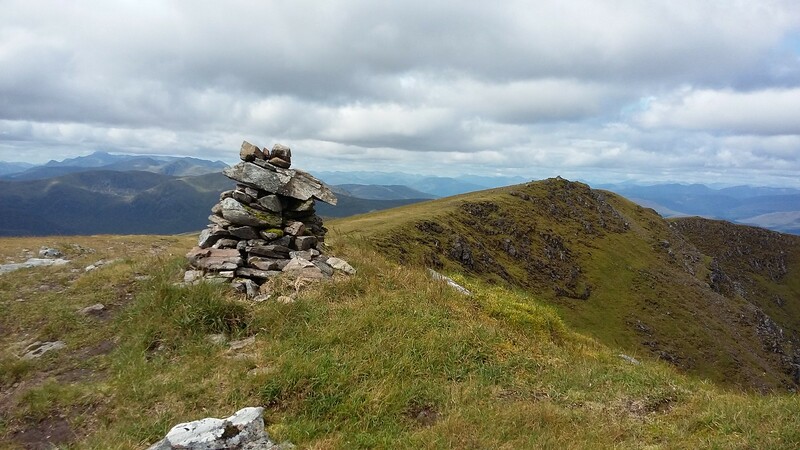 9 Munros and 5 tops . But being an inveterate fair weather walker, it had to be under the right circumstances. And it was going to be a longish walk, so I’d need plenty of daylight. To judge from some fantastic WH reports, there has been a fair deal of pretty decent weather this summer; but it also seems to have generally been allocated a day or two at a time, and so far this had clashed with other commitments. 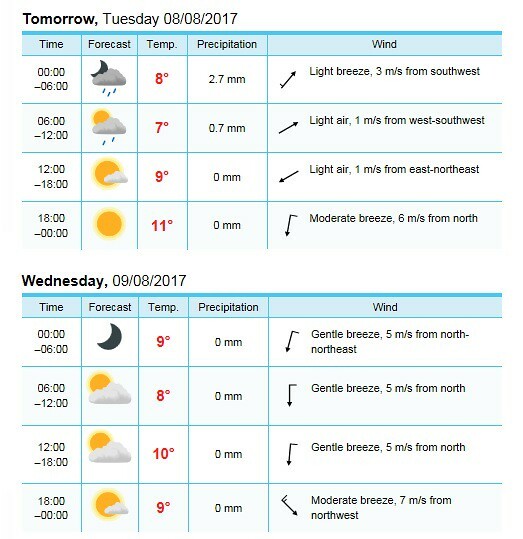 Both the UK and Norwegian Met Offices agreeing on their forecast! No further encouragement required . A pretty well problem-free drive saw me arrive in Dalwhinnie just before 5.00 pm on the Tuesday. Some of the tops were cloud-shrouded from time to time, and short, sharp showers alternated with that brilliant clear sunshine that follows rain. I wasn’t worried at all: this is what had been forecast. 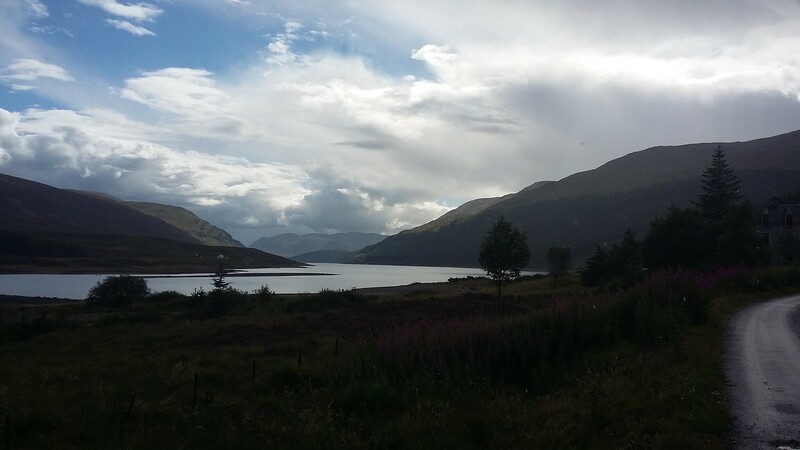 The cycle to Loch Pattack was far easier and quicker than I’d expected – the road is metalled as far as Ben Alder Lodge; and it runs through the forest on the north side of Loch Ericht, a brilliant preparation for the contrasting spare bleak wilds of the Alder massif. And even after that, the track is eminently bikable as far as Culra Bothy. 20170808_165906. 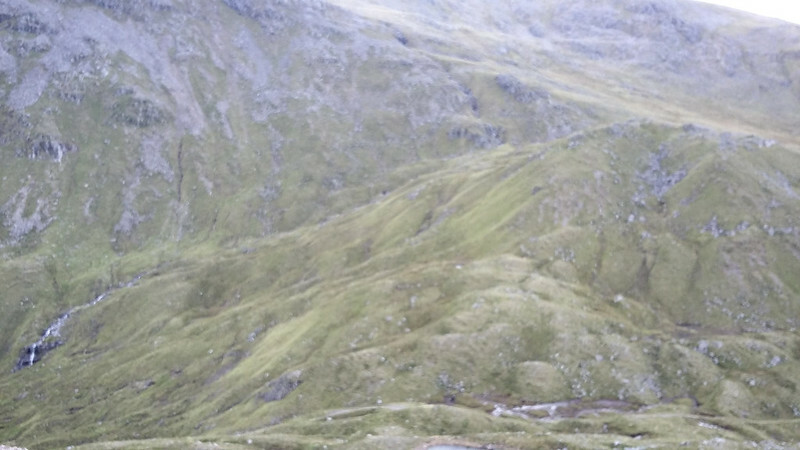 The view up Loch Ericht at the start is enough to start the adrenaline coursing through the system! 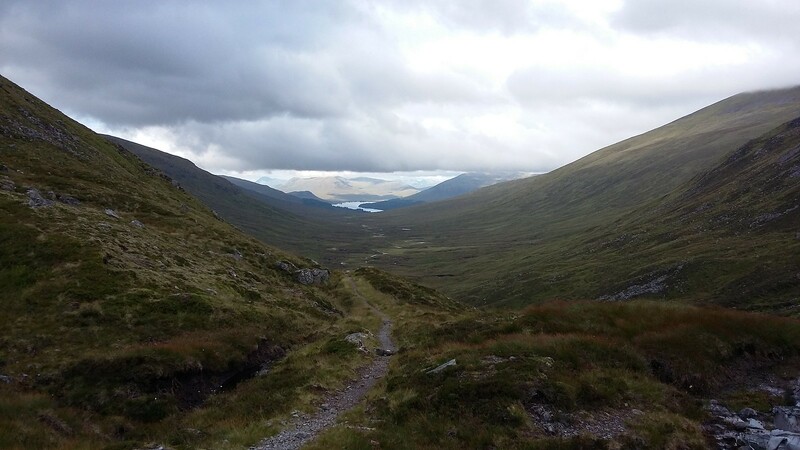 The track ascends slightly after Ben Alder Lodge; and when you crest the hill and drop a little you get this view of Loch Pattack. .20170808_175611. The suspension bridge is looking a bit rickety, but I don't want to risk wet feet by taking the ford at this stage... (the planned last hill for the morrow, Geal Charn showing centre pic). 20170808_180050. .... with this view looking north east across the Loch. Magic . Time to test the new aquisition - a superlight Force 10 Helium 2 man. A light breeze means that the vampire legions are obliged to remain grounded, thank goodness. And the tent goes up like a dream in a few minutes. Since I'll be starting in the dark in the morning and therefore won't get to see Culra on the morrow, once I've got my gear organised in the tent, I cycle further up the road to take a look at the bothy. 20170808_185712. 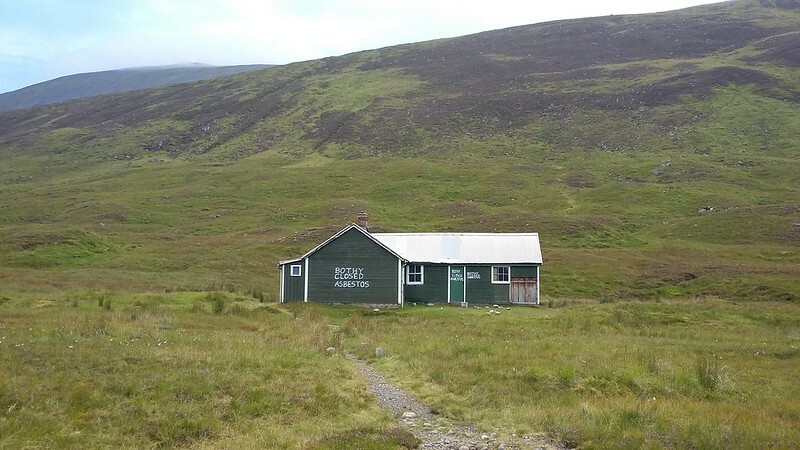 Sad to see such a romantic bothy closed, especially when one compares it to the rather unlovely Culra Lodge just to the west of it. Having said that, asbestos notwithstanding, it looks in quite poor condition anyway. It seems like a good opportunity for a rebuild, but I couldn't find a fund on line to make a contribution to (other than, obviously, the MBA). What a fabulous wild place, though! But I'm prepared with a head net and spray for the hands. The only problem is that just getting into the tent allows hundreds of the blighters to sneak in with me . So I spend the next 30 minutes in sadistic pleasure squashing them against the tent inner. During the night the breeze picks up again, and the tent seems rather noisy, notwithstanding the fact that I've guyed it quite tightly. 20170809_051738. ....while ahead Alder begins to show its corries. The going is a bit rough - low heather and tussocks, with the odd bit of bog that's easily circumnavigated - so perfectly acceptable. 20170809_054243. Once over Sron Dreineach the ground becomes much easier. 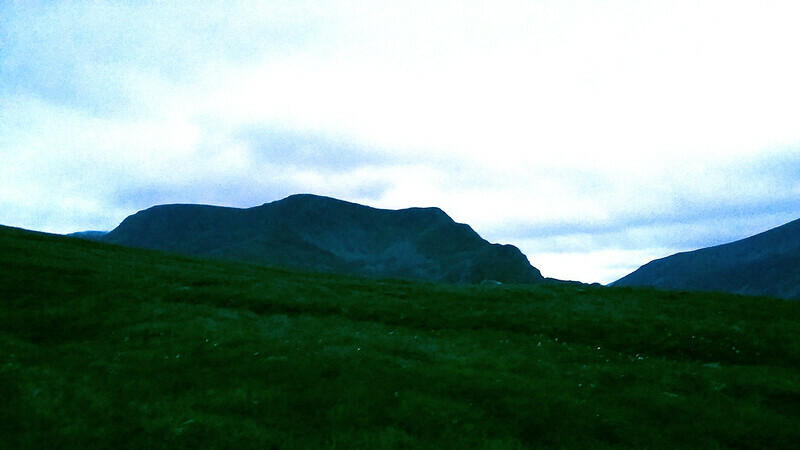 Beinn Bheoil showing to the left, and Ben Alder becoming clearer. 20170809_060256. 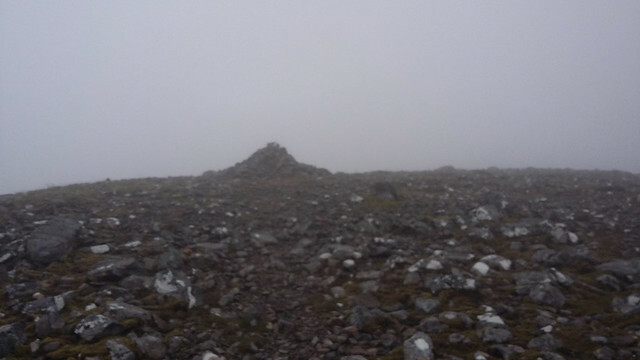 The conditions at the first summit, Beinn Bheoil, are in the very best Highland traditions . 20170809_060848. But the cloud quickly clears in the strong wind, giving great views south west towards Sron Coire na h-Iolaire. 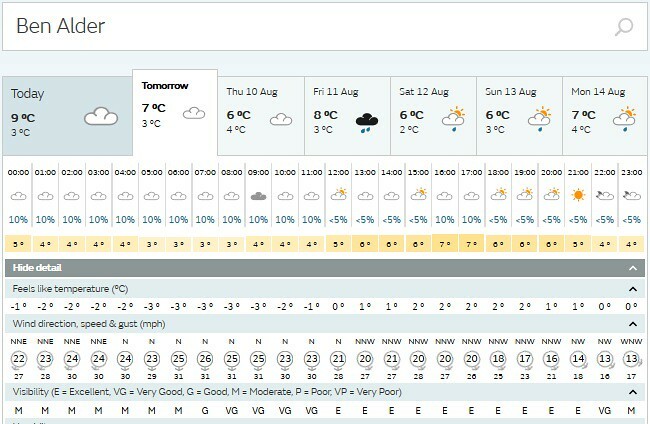 The strong wind is something that I hadn't expected, though it's clearly in the Met Office forecast - somehow I'd managed to overlook it; and with temperatures in the low single figures, it makes for a very chilly experience. Unusually, it's been necessary to maintain 3 layers, even when ascending Bheinn Bheoil. 20170809_063255. The views are really excellent now, especially looking west. 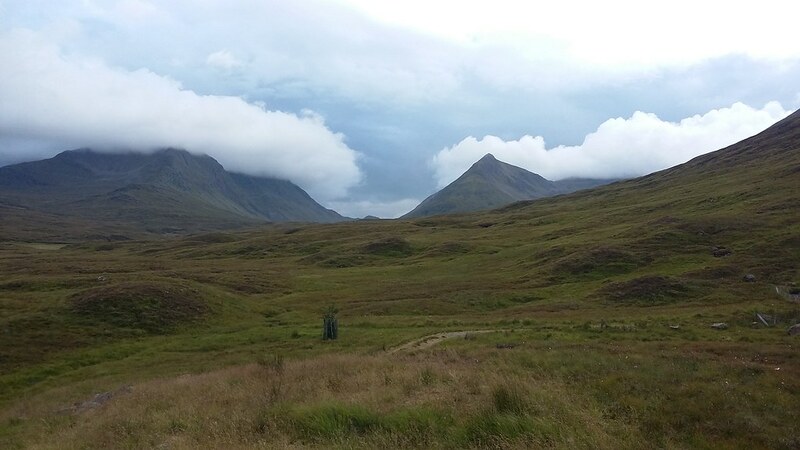 I suppose that the cloud-bound hill in the centre is the Ben, while the high hills to the left of the pic are Bidean nam Bian and company in Glencoe. 20170809_064425. 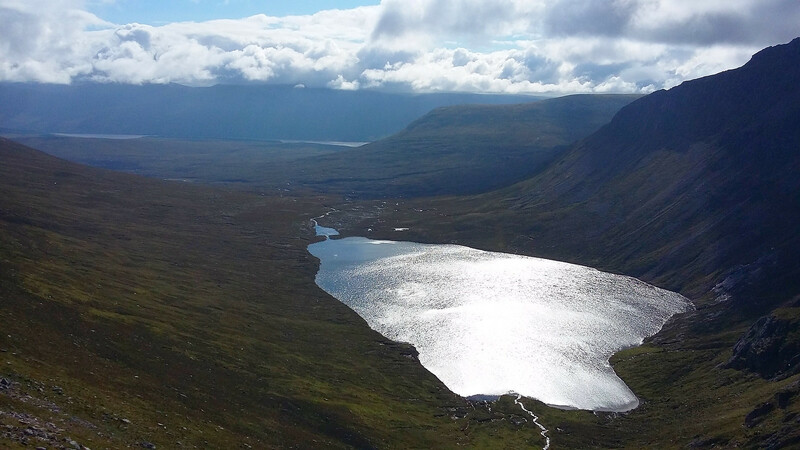 Looking north east across Loch a' Bhealaich Beithe from the bealach between Sron Coire h-lolaire and Ben Alder (Bealach Breabag). 20170809_071403. More or less on the plateau now, Garbh Choire and Garbh-Choire Beag looking moody in the fast-moving cloud. 20170809_073809. 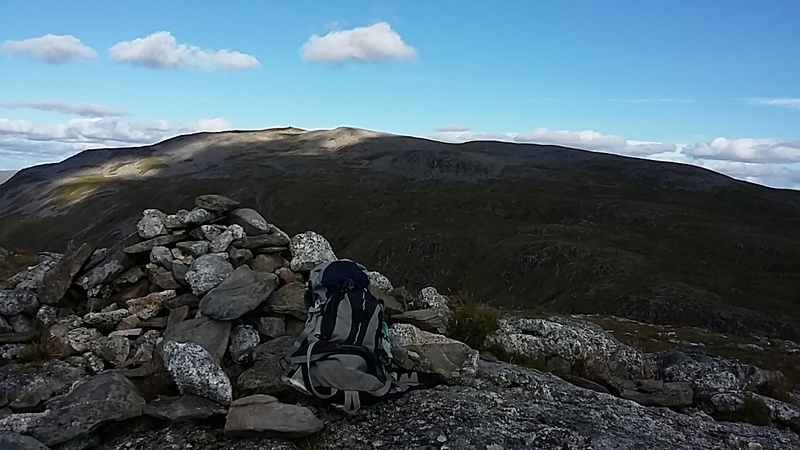 I reach the summit of Ben Alder about an hour ahead of schedule - which is good, since I know I'll be slower later. 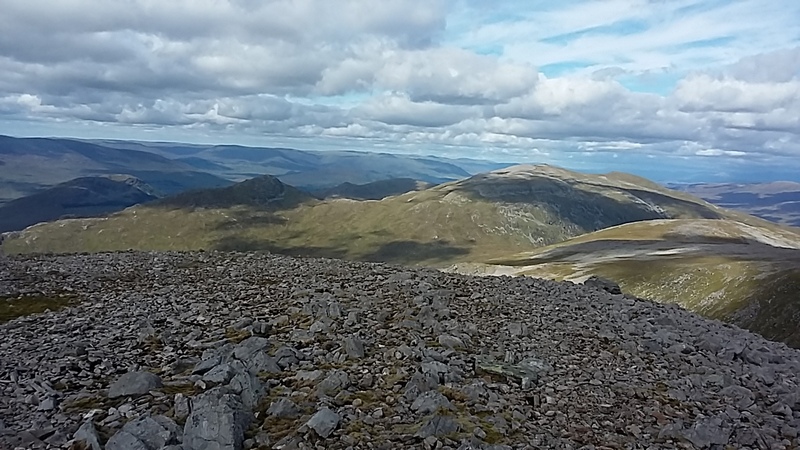 This view looking more or less west towards the Ben Nevis area shows the rather bleak Cairngorm-like character of the summit plateau. 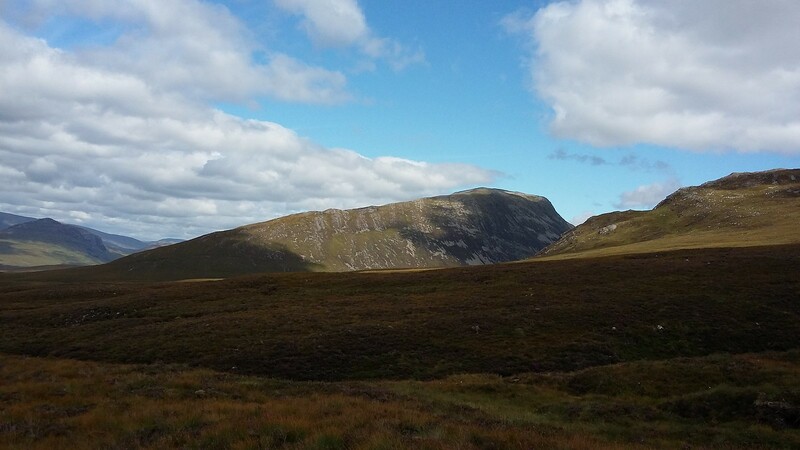 Like so many of the Cairngorm hills, the real attractive views are not the summits themselves but the views from the bottom, and part way up the slopes, of the corries, bealachs and lochans. 20170809_073905. And this is looking south towards Garbh Choire and Sron Bealach Beithe, with Lochan Garbh Choire just right of centre. Really spectacular - if you're so minded, it's worth clicking on this pano to get a better sense of the phenomenal view. I spend as long as I can trying to imprint the vista on my memory while munching a breakfast croissant - and that's not very long, because it really is cold! 20170809_083129. ...where I cross what looks like an old drovers' path. 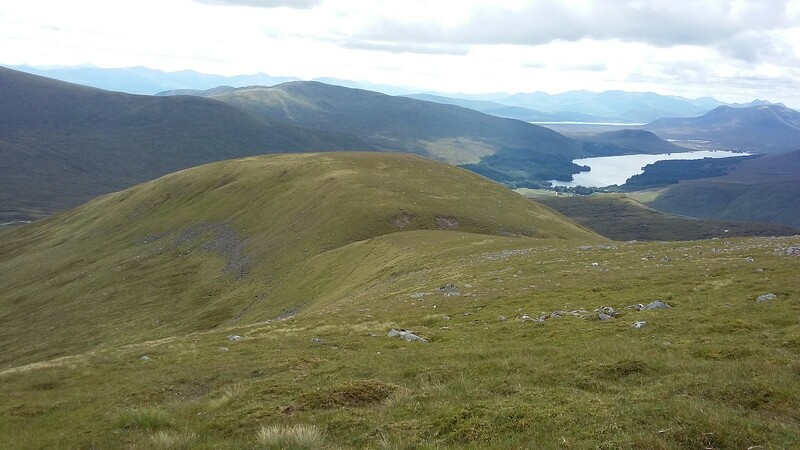 View here looking south west towards Corrour Shooting Lodge and Loch Ossian. 20170809_083052. View looking north west, with the cliffs that mark the edge of the Alder plateau showing to very dramatic effect. 20170809_083120. The side slopes of Sgor Iutharn look very steep indeed (LHS of pic). Very glad that I'll be ascending via the much gentle slope of the shoulder. 20170809_083412. 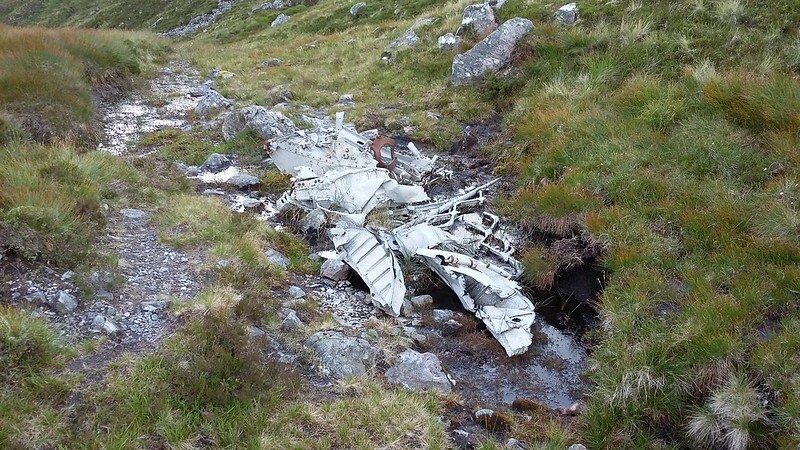 As I cross the path, I see this aircraft wreckage, which to me looks like the remains of a helicopter, but is in fact those of a second world war Wellington bomber. 20170809_084424. Looking back towards the descent from Ben Alder showing the lumpy topography that would make it a bit tricky to navigate in clag. 20170809_090531. The 300-odd metre ascent of Sgor Iutharn is on good terrain, and not so steep, so it's not long before I'm on the summit. Looking south across to the Ben Alder massif, the mixed cloud and sun make for a dramatic portrait (again worth viewing full size if you like this kind of pano). 20170809_090933. 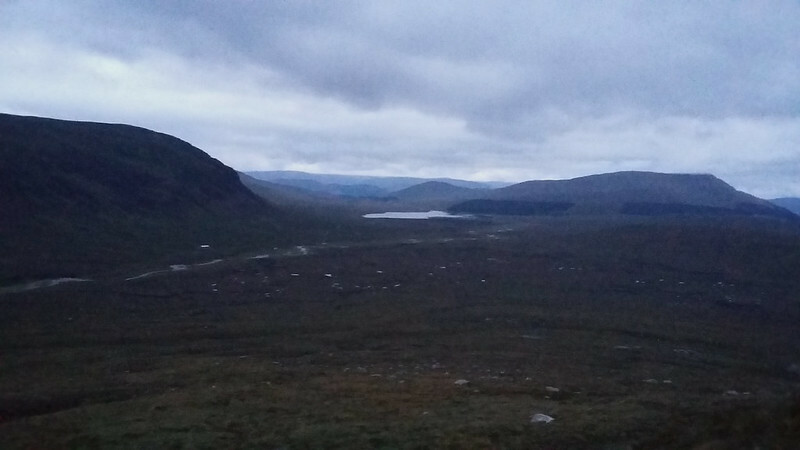 I stop for a while looking out north east from Sgor Iutharn across the Ben Alder forest and try to imagine what it might have looked like when the Caledonian forest cover was at its greatest, apparently about 5000 years ago. 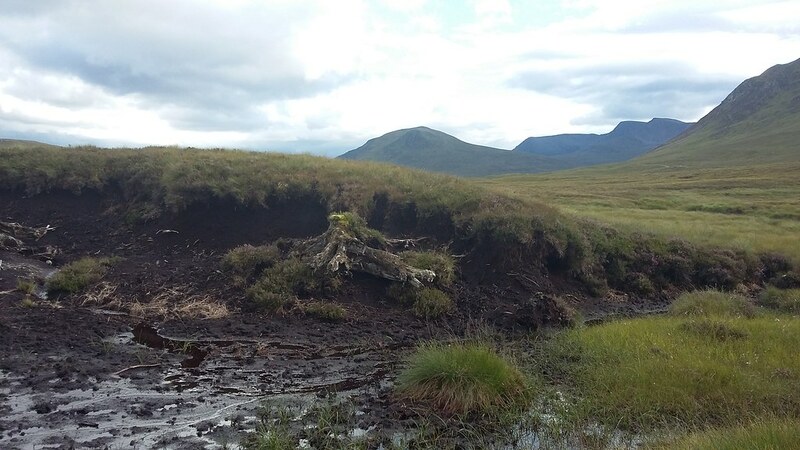 I find the plantation tree-planting from the last century has despoiled many parts of the Highlands, but it’s encouraging to regularly encounter areas now that are being replanted much less densely and with an appropriate balance and range of species. 20170809_093248. 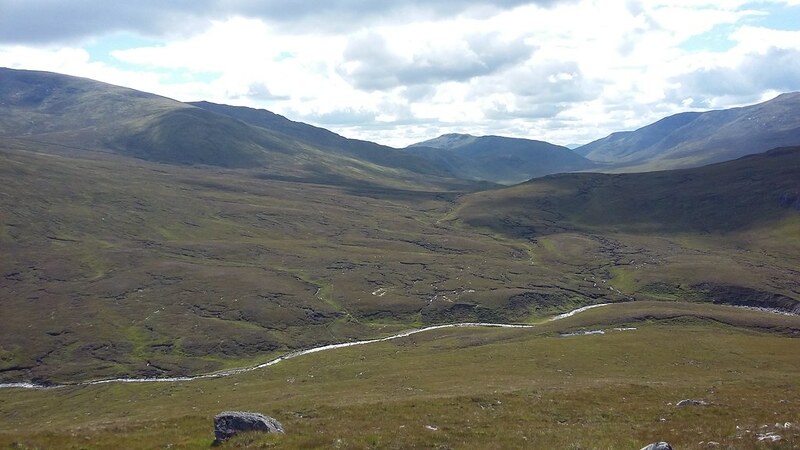 The going continues to be good, and shortly I'm in the bealach between Sgor Iutharn and Geal-Charn - Leacann na Brathan (this pic is taken looking back east towards Sgor Iutharn). 20170809_093258. 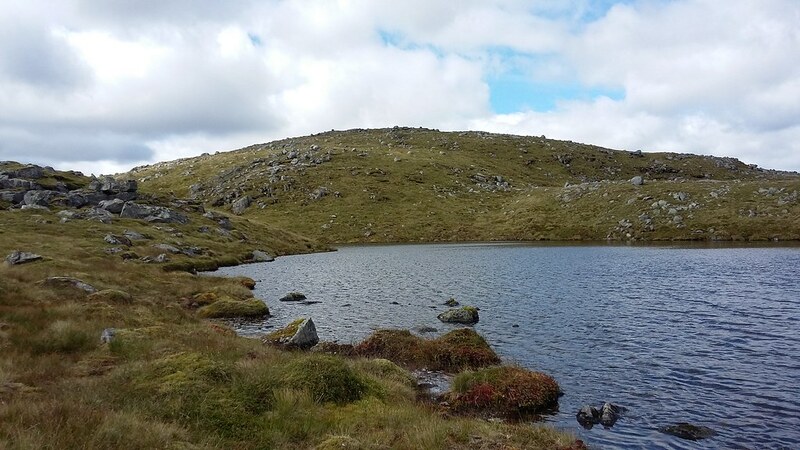 At this point, instead of continuing up to Geal-Charn, I traverse across Aisre Cham, which is characterised by a 20m wide lochan-bedecked ledge, that enables one to avoid an 150m ascent and descent to get to Carn Dearg. This pic gives a good idea of the terrain. 20170809_093312. 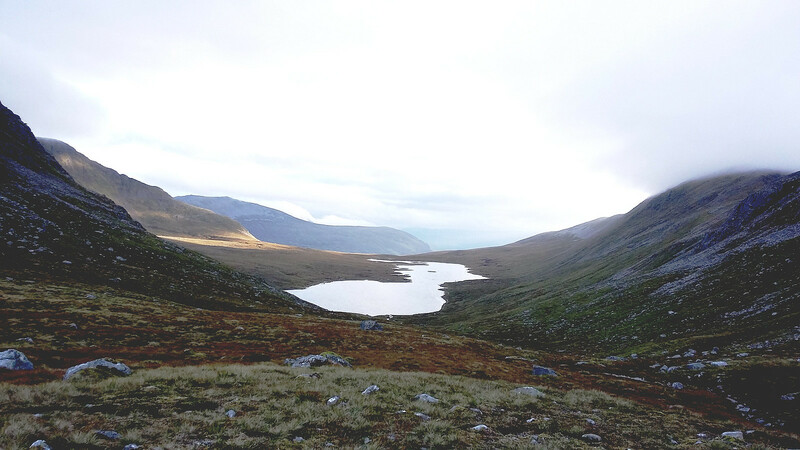 Looking east north east from "the ledge" across Loch an Sgoir towards Culra, with Loch Ericht showing in the background. 20170809_094106. The ledge continues more or less level until about 100 metres from Aisre Ghobhainn (the ridge that leads to Carn Dearg), at which point the ledge disappears, and it's necessary to traverse a rather steep grass and rock slope - about 45 degrees. Today it's not too difficult, but care would be needed in wet weather: it would be quite hard to stop if one once started sliding down the slope . Dollaid a'Chairn is the top in the foreground. 20170809_095123. ... though the peaks on the last leg of the walk are still shrouded in cloud - Beinn a' Chlachair on the LHS, and Geal Charn on the RHS. 20170809_095324. 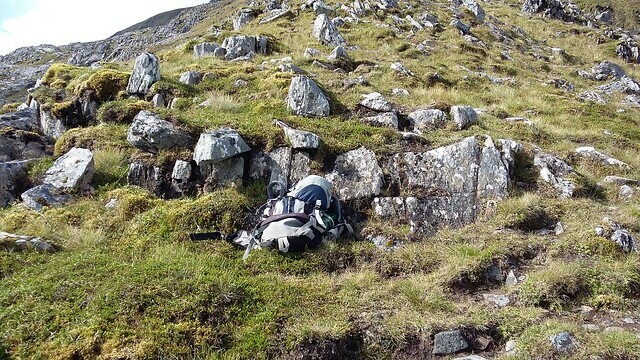 I leave my sac in the middle of the path (without a note to assure anyone who finds it that I have not gone off to commit suicide... pace RTC ), and after a long drink, head off along the ridge towards Carn Dearg. 20170809_100110. Looking out along the ridge to Geal Charn. 20170809_101044. ... and across at Ben Alder, with Beinn Bheoil and Loch an Bhealaich Bheithe just showing on the far left. Just fabulous! 20170809_102126. 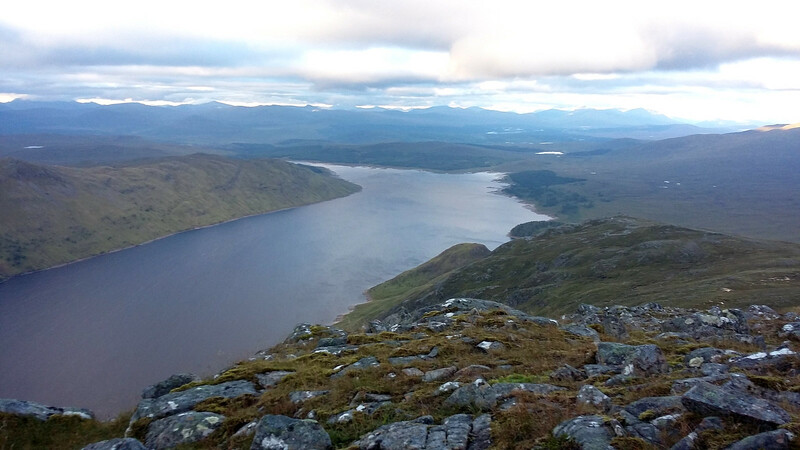 Loch an Sgoir viewed from close to the summit of Geal Charn. The ledge at Aisre Cham is clearly visible from here. 20170809_102918. Looking back from the summit itself. 20170809_105411. 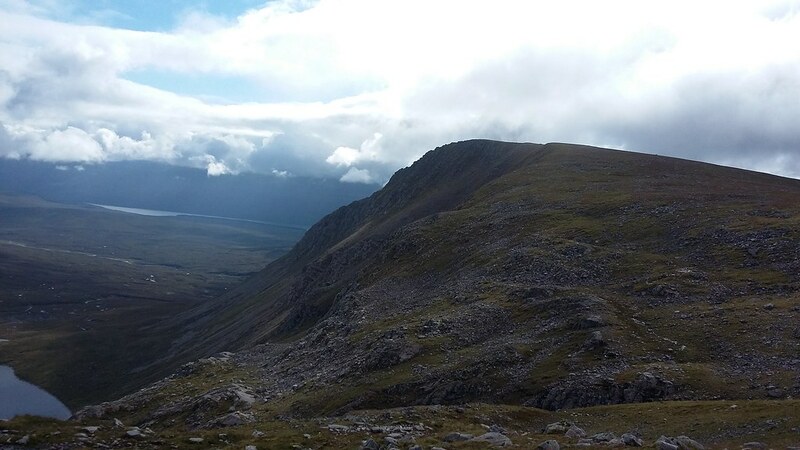 A speedy return over the top of Dollaid a'Chairn, and back at the start of Aisre Ghobhainn (the beginning of the ascent to Geal-charn), I take a few minutes to appreciate the cliffs overlooking Loch Coire Cheap, before starting up the ridge. I've left my sac square in the middle of the path, on a narrow ridge, so I can't possibly miss it, right....???? 20170809_115522. 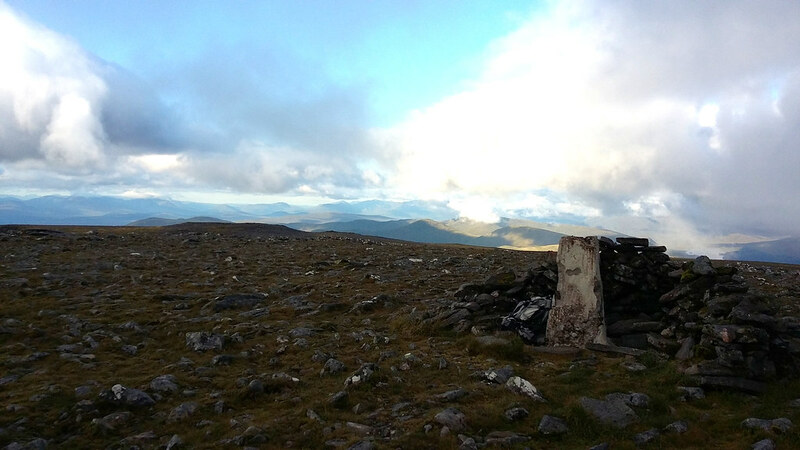 After that it's sound walking along to Geal-charn, with great views north from the edge of the plateau. I get to the summit still about an hour ahead of schedule, so there should be no difficulty getting back before dark - this is about the half-way point in terms of distance and ascent. 20170809_115809. 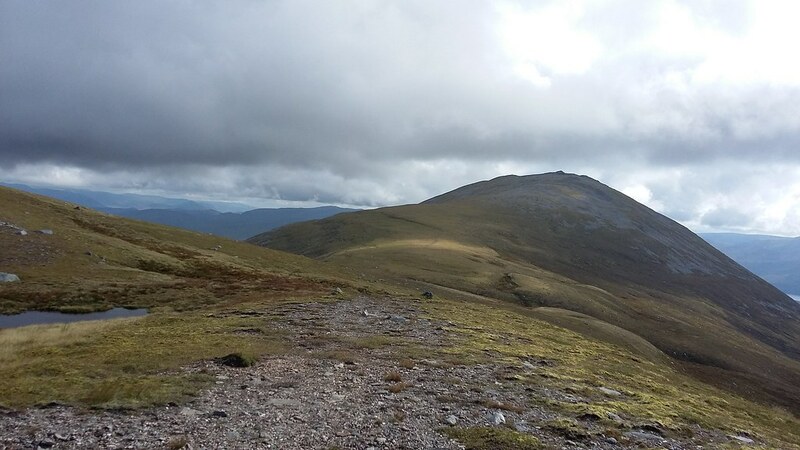 Ahead Aonach Beag and then behind, Beinn Eibhinn - a perfect ridge walk. 20170809_121626. 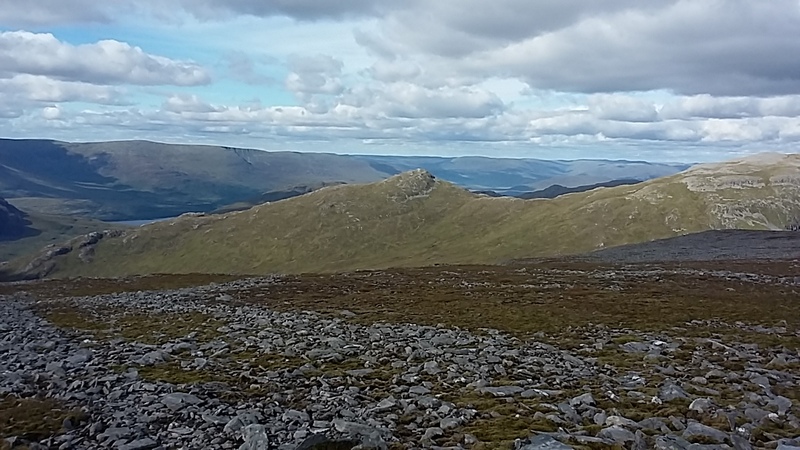 Looking back towards Geal-charn from close to Aonach Beag summit. 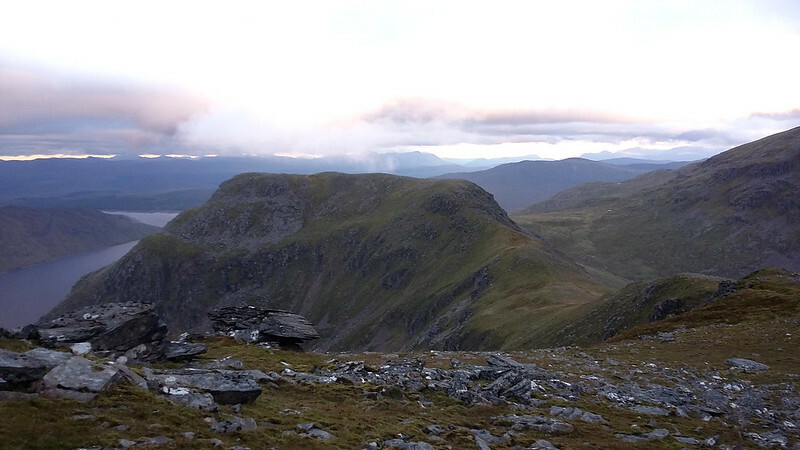 On the extreme LHS Beinn a'Chlachair, and a little to the right and further behind, Mullach Coire an Iubhair (Geal Charn), the last summit of the day. On the RHS, massive and dominant, the Ben Alder massif. 20170809_123637. 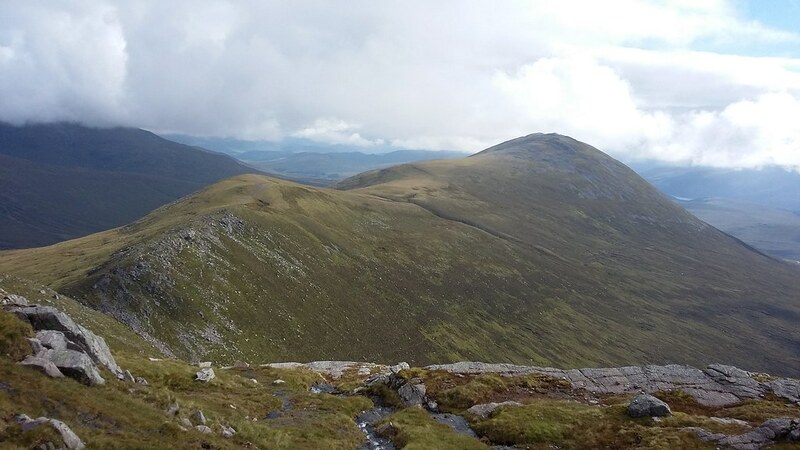 Looking back east along the ridge from Carr Mor towards Aonach Beag (foreground) and Geal-charn (behind). 20170809_130012. 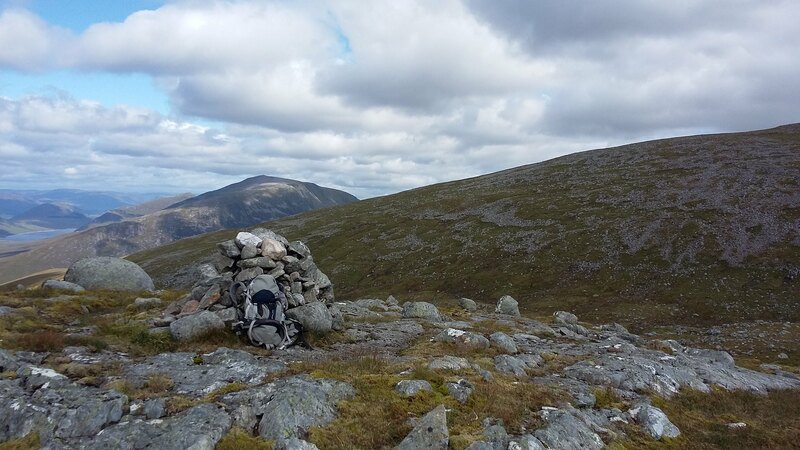 As I approach the first cairn I see another walker sat on the ground, and at first I think I recognise SpiderWebb (my eyesight is terrible ); but it turns out not to be he. The chap has come by train to Corrour with a folding bike, cycled along loch Ossian to the lodge, and then walked up the hill. I sit down beside him to consume a much needed cheeze-salami-and-Branston-Pickle sarni, and we chat for a while. 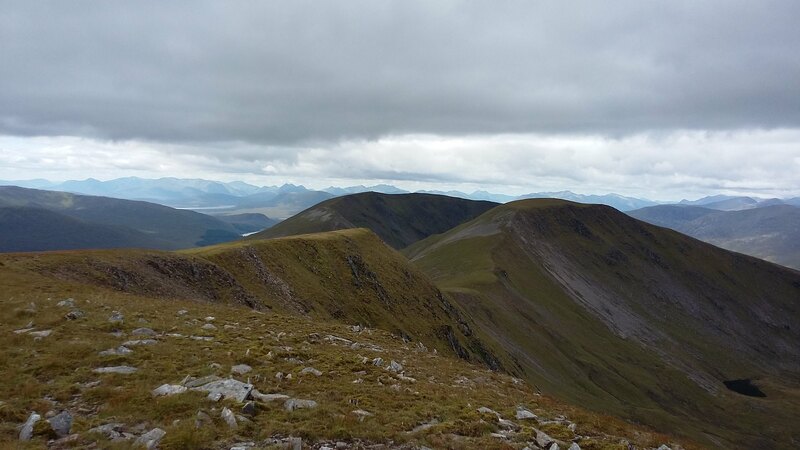 But then we both start to get very cold in the still strong wind, and so move on, he to Aonach Beag, and I along the ridge to the 2 waiting tops. 20170809_130532. This looking west from the end of the ridge, with the first top - Meall Glas Choire - on the extreme LHS. 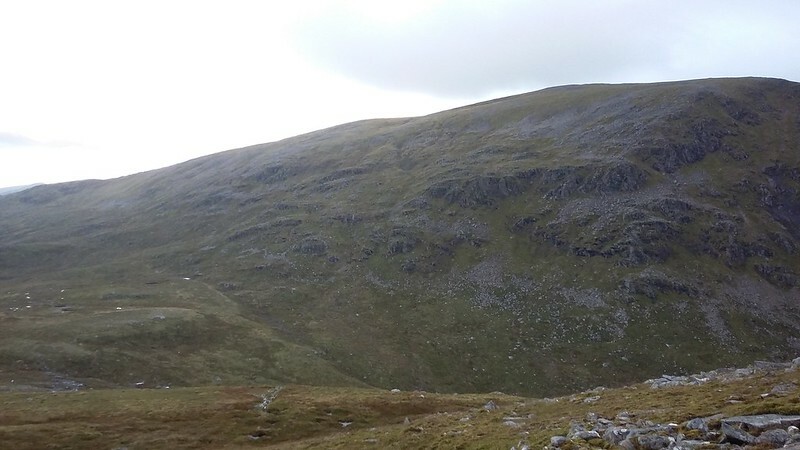 Being more than 100m lower than Beinn Eibhinn, it looks very unprepossessing! 20170809_133525. 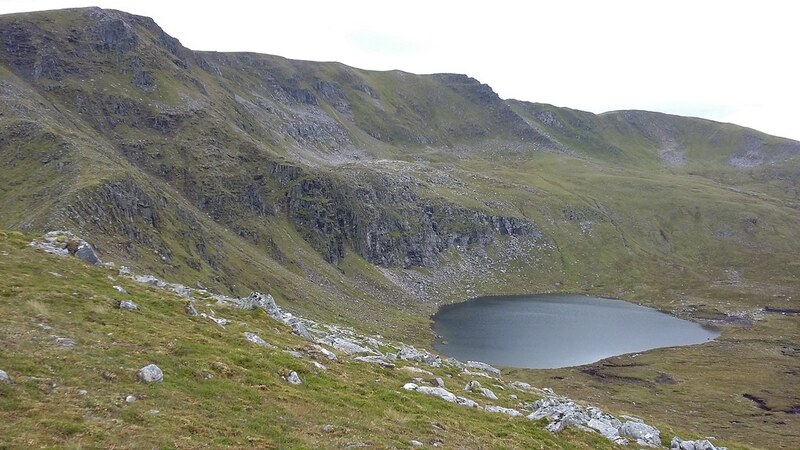 Passing the southern-most of the two tiny lochans just to the east of Mullach Coire nan Nead. MCnN itself straight ahead. 20170809_134227. 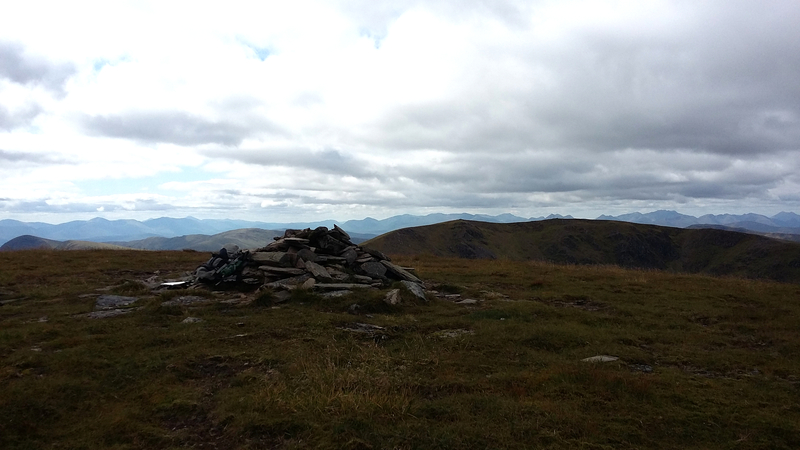 The summit of MCnN, looking north east towards Beinn a'Chlachair - it looks a looooooong way off . 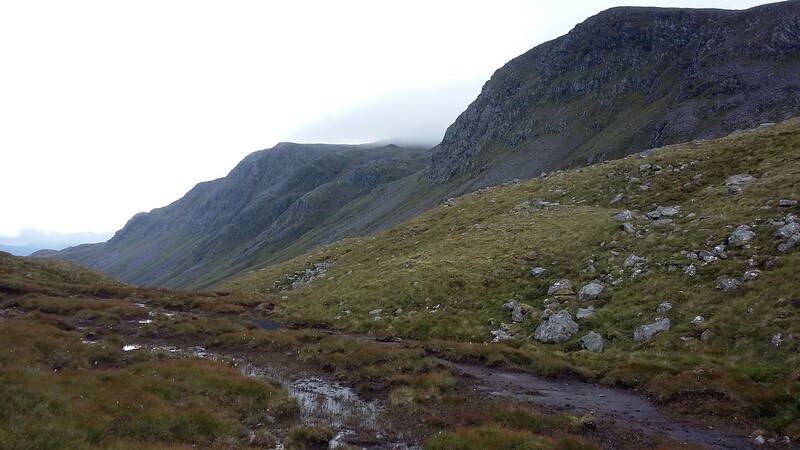 From here it's a 4 km yomp to the crossing point I'm planning, first descending the west shoulder of Sron an Fhuarain, then through a boggy flatland to the "stepping stones" on Allt Cam identified on the map. 20170809_142140. The whole of the shoulder of the hill seems to be one continuous bog feeding hundreds of little burns, so it's quite slow going. 20170809_143912. Eventually, about an hour later I get to Allt Cam. 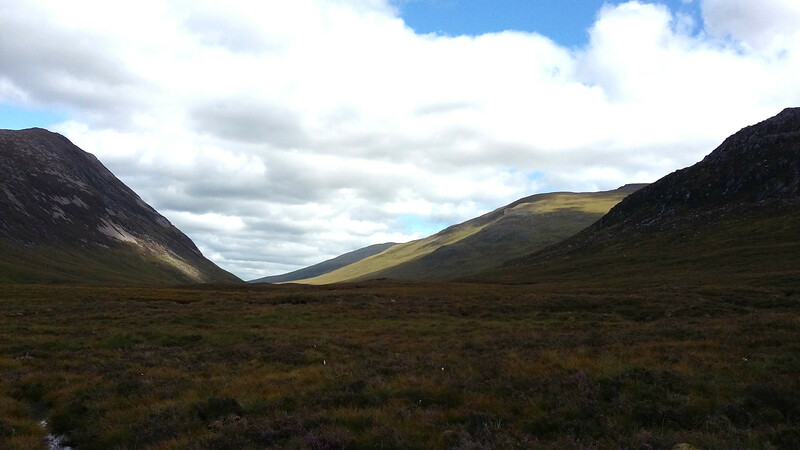 This view is looking east up the glen, with the steep southern slopes of Beinn a'Chlachair visible. I don't find anything that looks like man-made stepping stones, but I do find a place where I can cross by leaping between large stones, so my rubble bags remain in my sac . 20170809_153457. The view across to the ridge I've just traversed is quite superb. Unfortunately, as I take this last pic, there's a familiar bleeping from the phone: for the first time that I can remember on a walk, I'm running out of charge. I'll need to be sparing with the pics from now on. 20170809_162918. Whilst the summit is not particularly spectacular in itself, the views from it most certainly are. Looking south I can see from here 9 of the summits on my route so far. 20170809_162848. ... while looking north east, the last two hills of the day - Creag Pitridh and Geal Charn - are displaying magnificently in the late afternoon sun. 20170809_164917. I pay more attention to the surface now, as I head toward Creag Pitridh, the penultimate target. 20170809_173311. 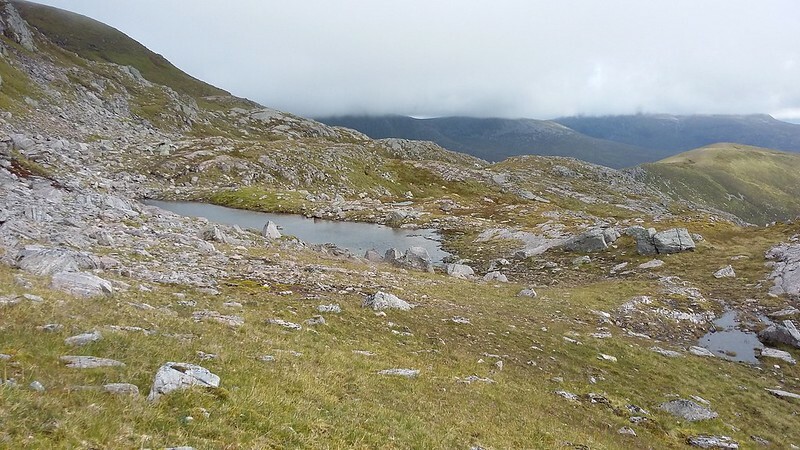 The crossing of Bealach Leahmain is a bit boggy, but acceptable. 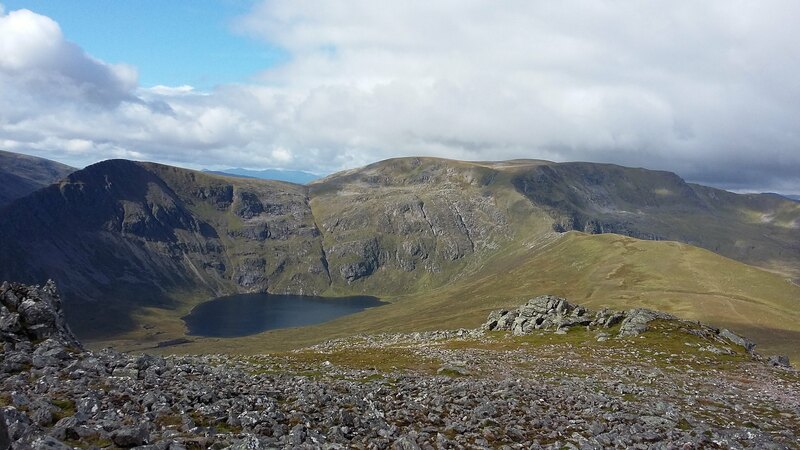 This view is taken from the bealach, looking back south west along the route I've just come from Beinn a'Chlachair. 20170809_175621. It's a short ascent to Creag Pitridh, the summit of which I reach just before 18.00, about 10 minutes behind schedule - I'm quite happy with this: I'll definitely get back in good light. 20170809_175647. A last look towards Glen Spean before I leave the CP and head towards Geal Charn. 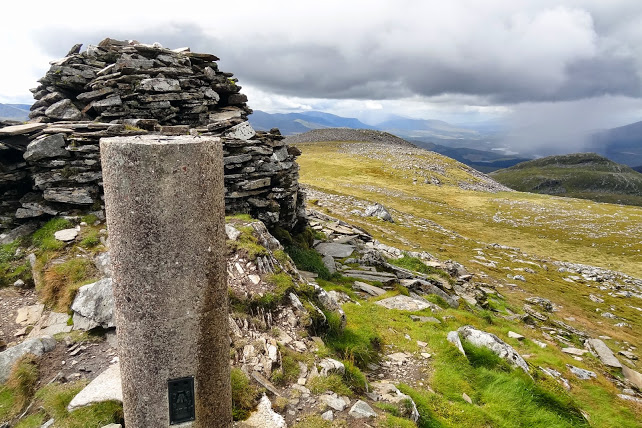 The drop off Geal Charn down to Loch Pattack is pretty straightforward, albeit it's a pure yomp over coarse turf, heather and towards the bottom, peat hags. But it's quite quick. In the end I do need to use my rubble bags to cross Allt Cam - the burn is knee deep! Route down from Geal Charn. ....but somehow I manage! After which I just crash out in my tent at about 8.30, and sleep through 'til 8.00 the next morning . Summary: this is a great - if quite physically challenging - route. 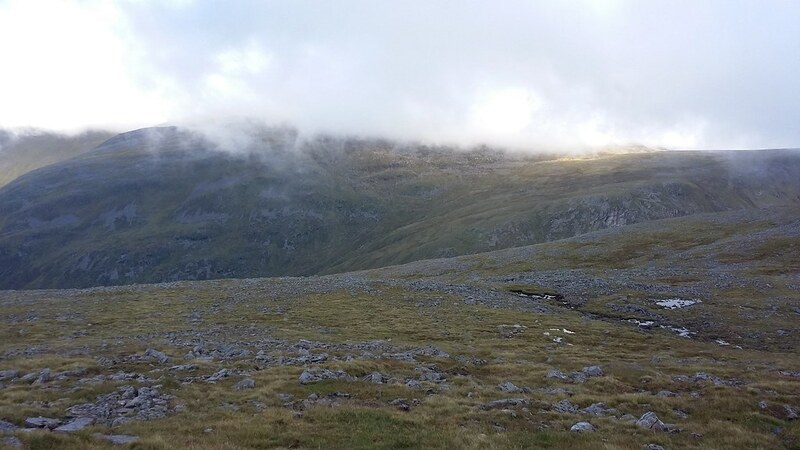 It's superbly wild and isolated - of the areas I've walked, I can only think of the Mullardoch area that compares (though the area West of Beinn Eighe/Liathach must be similarly remote). There are no real issues in terms of difficult ground or likely navigation problems, and importantly, there's plenty of flowing water along the entire route (I carried a 2 litre bottle, and I must have drunk at least another 4 litres from streams). I can highly recommend it. 20170808_180308. Postscript: right next to my pitch - Caledonian forest remnant...??? 3D Route View with summits. 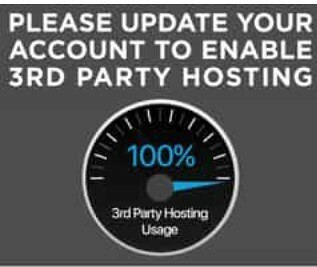 Last edited by Alteknacker on Mon Nov 26, 2018 10:32 pm, edited 4 times in total. Stunning hills, a great walk and report, thanks. I particularly liked the first panorama 20170809_073905. And this is also helpful as I've ideas about walking these (or some combination, over one, two or even three days) in a year to come. So the "ledge" at Aisre Cham seems handy; I'd thought and hoped it looked an option to save a bit of extra height and distance. Excellent report and walk AK. I'm always inspired by the epic proportions of your walks and how you manage to walk such a distance in a day. If I understand your TR correctly you left your car in Dalwhinnie and cycled the 10 miles to Loch Pattack? 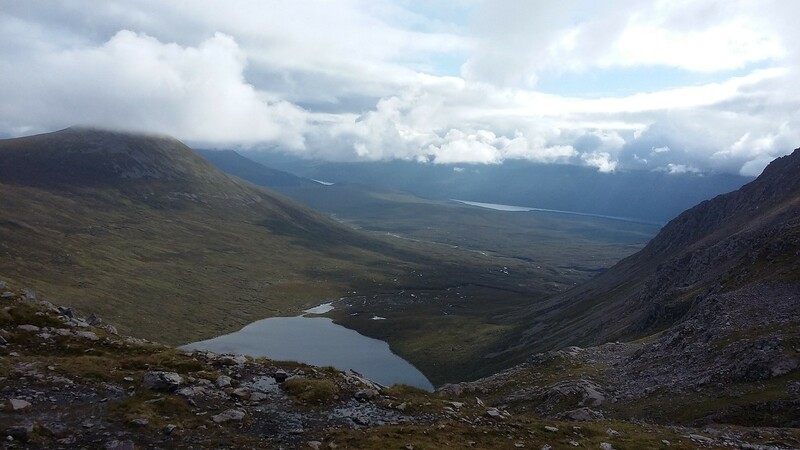 I ask because as always I am looking into options for my yearly walk in spring next year and the Ben alder region is high up on the list. But its also quite remote. Never ever thought of linking these but makes good sense. Epic barely covers it, an excellent adventure. I do like the annotated images with the summit names. I knew before clicking on it that your haunting sound would be divers. They really do get the hairs standing up on your arms when you hear them on a calm still morning. 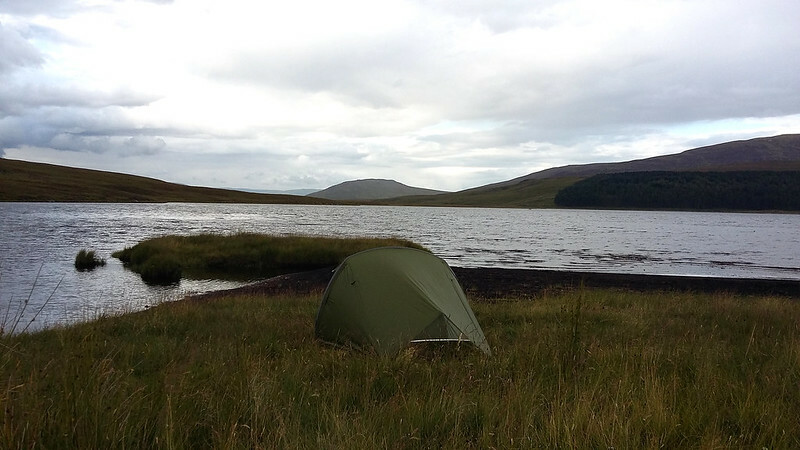 It took us 2 trips and 3 days to do this lot, although that included a stunning east west backpack between Dalwhinnie and Corour to do the Ben Alder 6. As for squishing midges we find burning pyrethrum (sp?) coils in the tent is the fastest (and laziest) way of getting shot of them. Brilliant effort and what a walk this was ! Took me back a few years ago when I walked among those magnificent hills. Hope your toenail is ok after all? 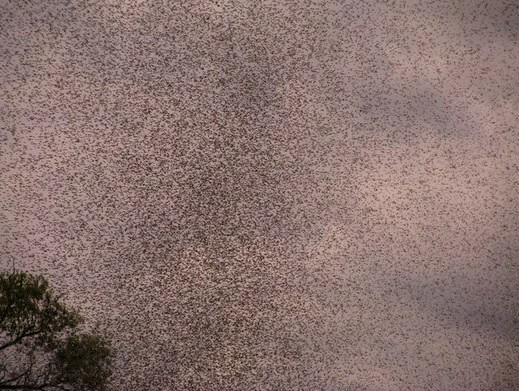 Loved the midge picture...one of my favorite ? activities in summer. Thanks RH. Bear in mind I didn’t cycle on the walk day . I read your report, and I must say I admire your determination to complete notwithstanding foot problems. Driftwood wrote: Stunning hills, a great walk and report, thanks. Thanks for the kind words, Driftwood. I’m really pleased you liked that odd panorama, because it blew me away at the time, and I was quite surprised it came out quite reasonably. 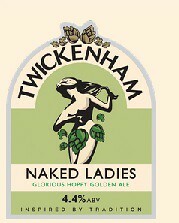 It’s also my favourite pic (except perhaps the pic of the beer label . Also really pleased if the description of the route at Aisre Cham turns out helpful – that’s exactly why I described it. The last bit of traverse on slope is fine if you’re OK doing this kind of thing with a bit of exposure, but I know that some folk aren’t. Not having to climb the hill and then immediately descend definitely gave me a bit of a psychological boost! And finally, glad if the water position description is useful. I’ve had so many “sahara desert” experiences due to not looking at this aspect carefully enough in advance, that if I can assist anyone in route planning in this regard, I’m very happy! Mancunian wrote: Excellent report and walk AK. I'm always inspired by the epic proportions of your walks and how you manage to walk such a distance in a day. Thanks for the kind comments – this report isn’t in the same league as the report of your week this year, which was really brilliant - so many fantastic images; and I mean: who gets a Broken Spectre from a plane...??? (but at least I didn’t use 6-wheeled mechanical means to hitch a lift… ). Yes, I left my car at Dalwhinnie and cycled to Loch Pattack. It’s a really easy and quick ride, and the beauty is that it gets you into the heart of the wilderness in no time at all (bit like the road up to Mullardoch dam). Not sure how you could arrange cycle transport, coming from Deutschland, in that I suppose hiring bikes for a full week is probably prohibitively expensive… But actually walking it may not be such a bad option either – it’s probably about 3 hours each way; but as bookends to several days in the area, probably not wholly unacceptable. Already looking forward to the report of next year's expedition . 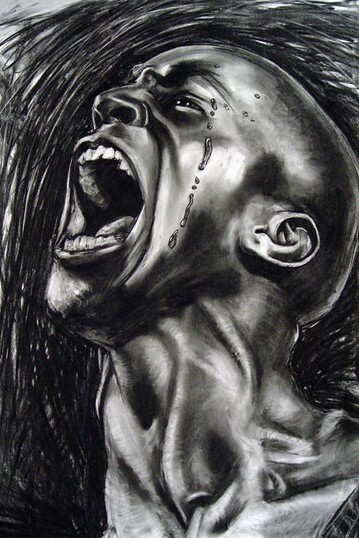 Definitely less epic than “the Madness of the Monar 8” (but it looks like you’ve “gone bike” these days…. ). b) to think that I needed to start multi-day walks, and get kitted out to go for them. Yes, it’s quite soothing and soporific, isn’t it? I like Huff n Puff’s tip about Pyrethrum coils, though – will definitely give that a try. With a midgey jacket as back-up (bought one in the garage at Dalwhinnie on the way back ). I like to have my own plans also - that trackless emptiness... so many possibilities .... so many excuses to pore over maps... ... one of the great joys of the Highlands. Another big one there, AK. 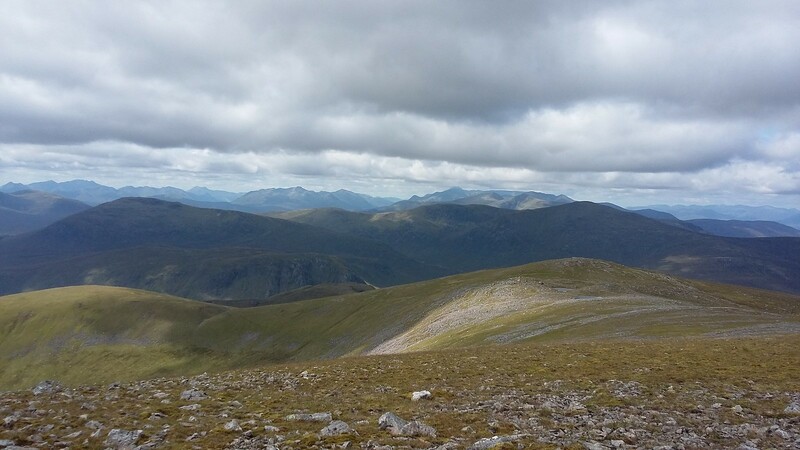 I was happy having done the 9 Munros in just three day walks, but your effort beats that. A great area to walk in, and it looks like you went for one long walk to get all the tops, rather than being tempted by some of the scrambles like Lancet Edge and the Leachas ridges.